There is a story which tells the early twentieth century tale of the Caledonian Railway Company rejecting the site at Harburn in favour of the more northerly location of Gleneagles in Perthshire for the location of their new golf resort. Fact or fiction – who knows? The point of the story is that it associates the moorland landscape at West Calder with one of the world’s finest inland golfing venues which can only enhance the reputation of Harburn Golf Club. Organised golf in the West Calder area began in 1885 with the formation of the West Calder and Addiewell Golf Club and their members played on land at Burngrange Farm until 1928. Three years earlier, in 1925, Hardale Golf Club had been established with a course at East Torphin Farm but they only lasted until 1932 when the present Harburn Golf Club took over. 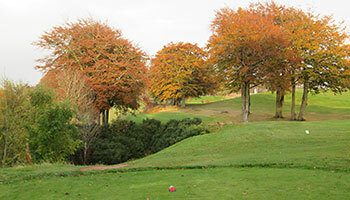 The course is a fine mix of moorland and parkland with many stands of mature trees throughout the routing. Holes 5 to 10 are played on the opposite side of the main Edinburgh to Glasgow railway line and there is water in the shape of the Bog Burn to contend with on holes 13 to 16. The signature hole is the 127-yard, par three, 15th named “Question Mark” where a pulpit green is protected by trees on the right and gullies front, left and rear. The putting surface slopes from back to front so a three on the card here is very well earned. I realized the other day that Harburn was the only Scottish GEM on this site that I hadn’t played (apart from Taymouth Castle, which is currently closed) so I nipped through to West Calder yesterday to remedy that situation. The par four 4th is all of 454 yards off the regular tees (it becomes an easier par five at 470 yards from the medal markers – I can never understand how an extra 16 yards can result in a full stroke advantage) and this hole is easily the toughest on the front nine, played to a challenging raised, 2-tiered green. I liked the par five 9th, leading to a green that sits behind a shallow ditch, but it’s followed at the 10th by one of the strangest holes I’ve ever come across – a par four that dips down to a nicely contoured green with an artificial pond located half way up the slope in front of the putting surface! The round steps up a gear between the 12th and 15th, starting with a delightful short par four and ending with a VERY short par three, where the tee shot is threaded through mature trees, across a deep gully to a green that slopes sharply from right to left. There’s a bit of a homespun feel to a lot of the holes at Harburn but I don’t mention that in a derogatory way as it actually adds a lot of charm to the course. Multi-level greens at holes 4, 6, 11 and 17 also add putting interest during the round. I can’t see this place making it into the Lothians rankings any time soon but it's deserving of its GEM status nonetheless. Harburn offers a reasonable if unmemorable round. There are some pleasant holes and the signature 15th is a truly memorable part 3. My other abiding memory is fear of hitting the cars parked just behind the last green!